Real Life Scenarios enable students to apply their knowledge to practical, professional challenges. Career Exploration features encourage students to explore various career paths and determine which healthcare careers interest them the most, while self-assessment opportunities guide students to careers that best suit their personal strengths. Background Lessons provide an opportunity for students to review basic concepts before beginning more advanced chapter material. The ExamView® Assessment Suite allows you to quickly and easily create, administer, and score paper and online tests. The ExamView® Assessment Suite includes the ExamView® Test Generator, ExamView® Test Manager, and ExamView® Test Player. This product includes 18 test banks with a total of 964 questions. This product contains presentations in PowerPoint format for each of the 18 chapters, comprising 630 slides of instructional material. Jacquelyn Rhine Marshall - for 35 years, has been a medical professional; a medical careers instructor for Regional Occupational Programs, California; a medical writer; and a consultant/writer for the Center for Occupational Research and Development in Austin, Texas. Ms. Marshall has authored several textbooks and written medical course curriculum for the state of California. 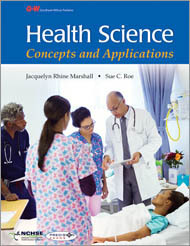 She has also developed several instructor guides and has edited or contributed to three medical series. Ms. Marshall holds degrees from the University of California, Berkeley; California State University, Hayward; and Notre Dame de Namur University. Dr. Sue C. Roe - has taught and designed academic courses and training programs in nursing, allied health, and health administration for over 35 years at both public and private universities and colleges and using a variety of delivery formats. She is the executive editor of Wholistic Now!, an online newsletter focusing on holistic health, wellness, leadership, and education. Dr. Roe is also a co-leader for the Arizona Holistic Nurses chapter of the American Holistic Nurses Association. Dr. Roe is manager and a member of The Roe Group Enterprises, LLC, a resource for educational materials about holistic health. She has a doctorate in public administration, with an emphasis in administration and health policy. In addition, she completed graduate-level work in educational administration and instructional development. Dr. Roe has extensive experience in nursing and nursing education and holds master of science and bachelor of science degrees in nursing.